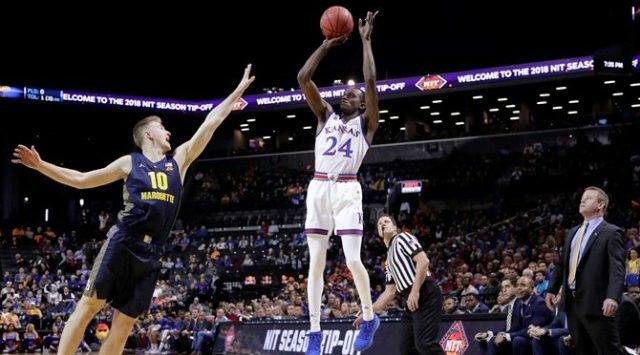 BROOKLYN, N.Y. – A commanding second-half performance by forward Dedric Lawson sparked the Jayhawks in a 77-68 victory over the Marquette Golden Eagles in the semifinals of the NIT Season Tip-Off Wednesday night inside Barclays Center. Lawson collected a double-double with a season-high 26 points and a team-leading 12 rebounds. Kansas advanced to the NIT final against No. 5 Tennessee on Friday, Nov. 23 at 8 p.m. (CT). The win moved the Jayhawks to 4-0 on the year, while Marquette dropped to 3-2 in its 2018-19 campaign. It was another shaky opening half for the Jayhawks who faced an eight-point deficit for the third-consecutive game, finding themselves trailing by 12 points, 42-30, with just over two minutes before the intermission. Marquette was able to build the lead with help from 11 first-half 3-pointers and headed to the locker room with a 47-38 advantage, the Jayhawks largest deficit at the break this season. The Jayhawk the defense got to work in the second half though, while the offense quickly went into motion. Lawson shot in two of his 26 points within the opening 20 seconds after the restart to kick off a momentum-swinging KU run. Kansas amassed a 22-0 run over the first nine minutes of the half to turn what once was a 12-point hole, into a 13-point advantage, with 11:02 to play in the second frame. From there, the Jayhawk defense took the reins, holding Marquette to a 25.9 field goal percentage in the second frame. Lawson added nine more points over the final 10 minutes of regulation. In addition to Lawson’s double-figure scoring performance, three other Jayhawks scored in double figures. Senior Lagerald Vick collected 16 points, his third-straight contest in which he has scored in double-figures. Sophomore Marcus Garrett recorded 11 points, a season-high and freshman Devon Dotson netted 10 points of his own.